Always buy the things that you see and fall in love with! Even if you don't know exactly where it will go right off the bat! If you love it you will make space for it. When you walk into a space, you never notice the things that match. They end up blending in with the walls, the sofa, the table tops, etc. It's the pieces that stand out that really grab your attention. When you play it safe with color and pattern everything will end up looking the same and nothing will stand out! The good thing about mixing colors and patterns and textures is that you don't have to keep everything the same all the time. You can move a pillow from your bed to the chair in your entryway to your sofa. You can even add new pieces and take pieces out. 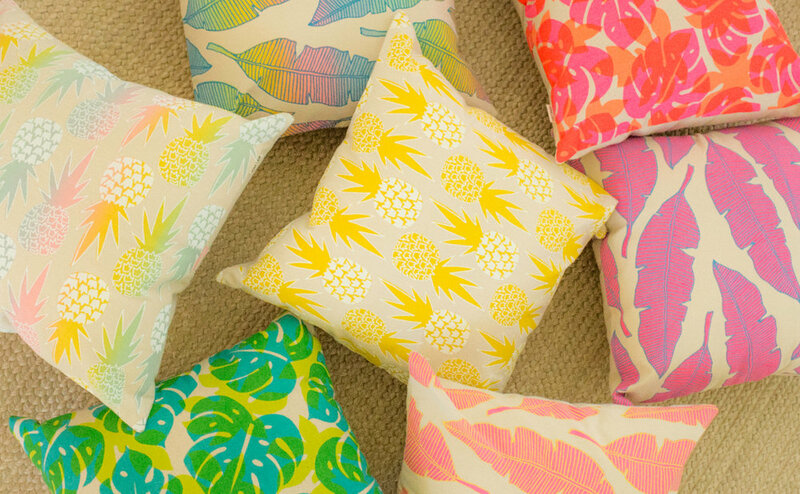 The Jana Lam studio spring intern Crystal ended her internship with a collection of pillows to liven up her home. She custom printed all her favorite prints and color combos (RULE 1: Choose pieces you love). It ended up being the most amazing rainbow of colors! In the space everything stands out! And you end up looking at everything, because it is all so fun and interesting (RULE 2: Have fun). Check out those curtains, the blanket, the pup, and the pillows! And last, but not least! The pillows in a different space go just as well (RULE 3: Change things up).